There are few feline issues as controversial as declawing. There is a great deal of myth and misinformation out there about it. If you are considering having this surgery performed on your cat, or if a veterinarian has suggested it, please read this article first to learn more about this major surgical procedure. Isn’t it worth a few minutes of your time to make sure that you make a rational and informed decision? Declawing is not a simple or routine surgery. It should never be done as a “preventative,” especially in kittens. Despite their reputation for independence, cats can readily be trained to leave the sofa, curtains, or carpet untouched. Using surgery to prevent or correct a behavioral problem is expedient, but it is definitely not the smartest, kindest, most cost-effective, or best solution for you and your cat. Your veterinarian has an obligation to educate you as to the nature of the procedure, the risks of anesthesia and surgery, and the potential for serious physical and behavioral complications, both short- and long-term. Many people report that they are happier with their cats after declawing, because it makes the cats “better pets.” Unfortunately, as many people discover too late, declawing may cause far worse problems than it solves—research suggests that more than 30% of cats develop more serious behavior problems, such as biting and urinating outside the litterbox—after surgery. There are many better ways to treat behavior problems other than radical and irreversible surgery. Declawing, which is rightly described as “de-toeing” when the same procedure is done to chickens, is the amputation of each front toe at the first joint (hind foot declaws are not commonly done but would be equivalent). This is necessary because, unlike a fingernail, the claw actually grows from the first toe bone. The procedure is so excruciatingly painful that it was once used as a technique of torture, and even today it remains the primary test of the effectiveness of pain medications. Physical recovery takes a few weeks, but even after the surgical wounds have healed, there are other long-term physical and psychological effects. For the surgery itself, the cat is put under general anesthesia and the toes are prepared with antiseptic soap. A tourniquet is placed on the cat’s leg and tightened to prevent excessive bleeding. Using a scalpel, the surgeon grips the tip of the claw wittourniquet declawh a small clamp, and uses scalpel to carve around the third phalanx, cutting through the skin and severing tendons, nerves, and blood vessels. In another technique using a guillotine blade (Resco), a sterilized veterinary nail clipper is used to cut the tissues photos can be seen at lisaviolet.com). A scalpel should be (but is not always) used to remove the last piece of bone. If this is not done, the claw can regrow, although it will be deformed. The wound is typically closed with sutures or surgical glue, but some vets rely on bandages to control the bleeding. Tight bandages restrict the normal response of the tissue to swell, causing intense pressure and pain. LASER surgery is similar to the scalpel technique, although the LASER cauterizes the blood vessels by burning them as they are cut. It is a difficult technique to master, and complications can still arise. The photo at right shows the burns from a LASER surgery. In cats, the claws grow directly from the bone. If even the tiniest piece of the bone is left in the socket, it can become infected and/or regrow, both of which are very painful. Here’s a video of a Rescue declaw. Are claws so important to a cat’s well-being? Claws perform a number of vital functions for the cat. By scratching various surfaces, cats create a visual and scent identification mark for their territory. Claws provide psychological comfort through kneading, help the cat climb to safety or a secure vantage point, and help the cat fully stretch his back and legs. A declawed cat never again experiences the head-to-toe satisfaction of a full body stretch! Surgical complications: Not everyone is having a good day, not every surgeon is careful and competent, and not every surgery goes well. Poor technique, a mistake in positioning, problems with tourniquets (including irreversible nerve damage), and inexperience are just a few of the things that can go wrong during declawing amputations. Post-surgical complications: Abscesses and claw regrowth can occur a few weeks to many years after surgery. Chronic or intermittent lameness may develop. In one study that followed cats for only 5 months after surgery, nearly 1/3 of cats developed complications from both declaw and tendonectomy surgeries (digital tendonectomy is a procedure whereby the tendons that extend the toes are cut; it’s sometimes promoted as an “alternative” to declawing. However, because these cats require constant maintenance and frequent nail clipping to prevent injury, most are eventually declawed anyway). Biting and urinating outside the litterbox are the most common behavior problems reported, occurring in over 30% of cats. 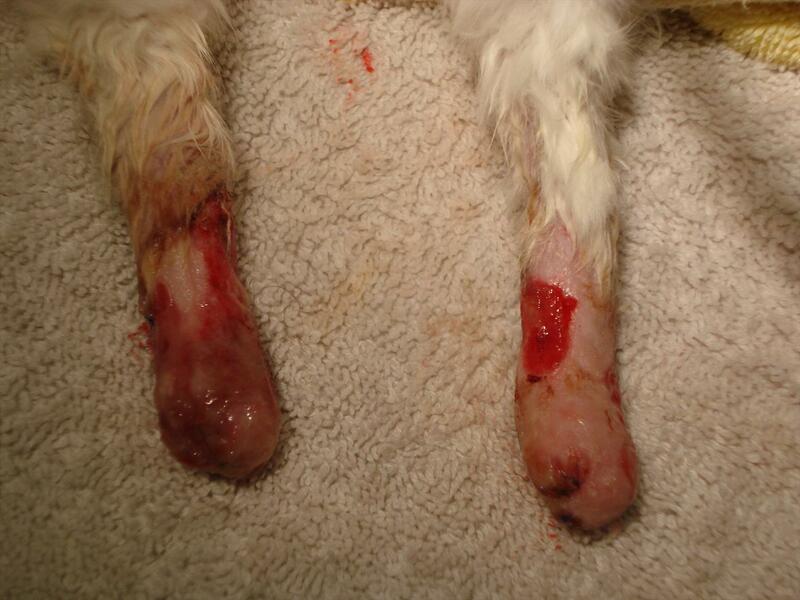 The photo on the right shows complications from declawing a 6-week old kitten. Because she kept bleeding after surgery, bandages were applied; they were too tight. Subsequently, the skin on her lower legs and feet as well as paw pads became necrotic (dead) and sloughed off. Pain: It is impossible to know how much chronic pain and suffering declawing causes, because cats are unable to express these in human terms. However, we can compare similar procedures in people. Virtually all human amputees report “phantom” sensations from the amputated part, ranging from merely strange to extremely painful (about 40% of such sensations are categorized as painful). Because declawing involves at least ten separate amputations, it is virtually certain that all declawed cats experience phantom pain in one or more toes. In humans, these sensations continue for life, even when the amputation took place in early childhood. There is no physiological reason that this would not be true for cats; their nervous systems are identical to ours. Cats are stoic creatures, and typically conceal pain or illness until it becomes overwhelming. With chronic pain, they simply learn to cope with it. Their behavior may appear “normal,” but a lack of overt signs of pain does not mean that they are pain-free. 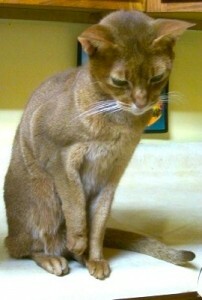 This declawed Abyssinian cat (left) shows 4 distinct signs of pain: (1) half-closed eyes, (2) pulled-back whiskers, (3) holding the right front foot up, and (4) placing the left front foot over the edge of the counter so there’s as little weight on his painful toes as possible. Joint Stiffness: In declawed (and tendonectomized) cats, the tendons that control the toe joints retract after surgery, and these joints become essentially “frozen.” The toes remain fully contracted for the life of the cat. In cats who were declawed many years ago, the toe joints are often so arthritic that they cannot be moved, even under deep anesthesia. The faChanges in anatomy after declawingct that most cats continue to make scratching motions after they are declawed is often said to “prove” that they do not “miss” their claws. However, this behavior is equally well–and more realistically–explained as desperate but ineffective efforts to stretch those stiff toes, legs, shoulders and backs. Arthritis: Research has shown that, in the immediate post-operative period, newly declawed cats shift their body weight backward onto the large central pads of the feet, and off the sore toes. This effect was significant even when strong pain medication was given, and remained apparent for the duration of the study (up to 40 hours after the surgery). If this altered gait persists over time, it would cause stress on the leg joints and spine, and lead to damage and arthritic changes in multiple joints. One large study showed that arthritis of the elbow is very common in older cats. When contacted, the researchers admitted that they did not ask or record whether the cats were declawed, perhaps preferring the “don’t ask, don’t tell” policy so as not to anger those many veterinarians who make a lot of money from declawing. Litterbox Problems: Experts say that declawed cats have more litterbox problems than clawed cats, and the statistics prove it. Not many people would choose urine-soaked carpeting (or floorboards, sofa cushions, walls, bedding, or mattresses) over a few scratch marks, but this is a distressingly common outcome. In one survey, 95% of calls about declawed cats related to litterbox problems, while only 46% of clawed cats had such problems – and most of those were older cats with physical ailments that accounted for the behavior. Some households with declawed cats have spent thousands of dollars replacing drywall, carpets, and subfloors to repair urine damage. Biting: Some experts believe that cats who are declawed are likely to become biters. Many declawed cats do seem to “notice” that their claws are missing, and turn to biting as a primary means of defense–not a good choice for a cat in a home with children or immunocompromised individuals. Change in Personality: This is a common complaint: “my cat has never been the same.” A friendly, delightful kitten may become a morose, fearful, or reclusive cat, never to recover its natural joy, grace, and love of exploration. Neglect, Abandonment, Relinquishment, and Abuse: Declawing that results in biting or inappropriate elimination outside the litterbox may result in the cat being permanently locked in the basement, dumped at a shelter, or simply abandoned. Many cats are exiled to a life outdoors because of abandoned cat these unwanted behaviors. There, they also risk injury or death by dogs, cars, wild predators, disease, poison, and other hazards of outdoor life; even more so than clawed cats who retain their primary defenses. People who work with feral cat Trap-Neuter-Release programs often find declawed cats in their traps–cats who should never have been outside at all. These cats once had homes, but were abandoned in an alley or field–almost certainly due to behavior problems resulting from declaw surgery. The claim by veterinarians that “declawing keeps cats in their homes” clearly isn’t true for these declawed cats who lost their homes and were abandoned to an uncertain fate. There is no way to know how many cats are dumped this way, but based on experiences in Denver, a typical urban environment, the number is likely in the many thousands. Death: There is always a small but real risk of death from any general anesthesia, as well as from bleeding or other surgical complications. Declawing that results in biting or litterbox avoidance can soon get the cat relinquished to a shelter. Such behaviors make these cats unadoptable, and after a few frightening days alone in a cage, most will be euthanized. For exiled cats, it is unfortunately common for outdoor cats to be stolen and used as defenseless live bait to be torn apart by fighting dogs being “blood-trained,” or sold to laboratories or biological suppliers. It’s an ugly reality that a tame, friendly, declawed cat makes an ideal experimental subject. What about LASER declawing–isn’t that better? Laser declawing causes the same long-term consequences as any other method. Why do so many veterinarians suggest declawing cats? Many veterinarians in the U.S. and Canada have become accustomed to performing the declawing procedure without thinking about–or even recognizing–the common complications. Some even recommend declawing kittens at the same time they are spayed or neutered, whether or not they have developed destructive scratching habits. However, this goes against the express written policy of the American Veterinary Medical Association. All the top veterinary behaviorists agree that declawing should not even be considered until all other options, including training and deterrents, have been sincerely tried and failed. Veterinarians who, for example, declaw young kittens are violating this AVMA policy. Several telephone surveys have found that every single veterinary clinic contacted was willing to declaw a cat without providing–or even offering–behavior counseling or alternatives to the surgery. They did not ask whether training or alternatives had been tried. They didn’t even ask if the cat had a scratching post. These clinics are in direct violation of AVMA policy. Who says declawing is a bad idea? Declawing is illegal or considered extremely inhumane in dozens of countries around the world, including most “civilized” nations. It is against the Conventions of the European Union. In countries where declawing is legal, such as New Zealand, Thailand, and South Africa, it is just “not done.” Declawing is common only in the United States and Canada. In 2006, the USDA–normally an extremely conservative federal agency–amended the Animal Welfare Act to prohibit declawing of exotic carnivores, saying that it “can cause considerable pain and discomfort to the animal and may result in chronic health problems.” In 2007, after much legal wrangling, the California Supreme Court upheld a ban on declawing enacted by the city of West Hollywood, CA, in 2003. How can I stop unwanted scratching behavior without declawing? Cats of any age can be trained not to scratch furniture or other objects–including people–although it is easier if the cat is trained as a kitten. Amazingly, many people do not even know that they should provide a scratching post for their cats; nor do they realize that in many cases, they have to train the cat to use it. Because scratching is such a deeply ingrained instinct in cats, if there is no appropriate spot, they will be forced to substitute furniture or other objects. Ai vertical scratching post should be at least 28-36″ high to allow the cat to stretch to his full height. Many cats prefer natural soft wood, such as a section of bark-covered log or a cedar or redwood plank, or posts covered with sisal rope, which is more popular with cats than the carpeted surfaces of many posts. The post must be very sturdy and stable; if it wobbles, your cat is unlikely to use it. Rubbing the surface with catnip, or using a catnip concentrate spray, may enhance the attractiveness of the post. For the more adventurous types, there are cat trees in dozens of sizes and colors, with features such as hidey-holes, lounging platforms, dangling toys, and other creative amenities. Like to do it yourself? There are plans for easy-to-make posts on the Internet or in many cat books. Don’t be too quick to discard a shabby, well-worn post–that’s when it’s the most attractive to your cat! With scratching posts, as in real estate, think “location, location, location.” Start with the post near kitty’s favorite scratching object, and gradually (by inches) move it to its final destination. See our articles on “Cats and Claws–Living Happily Ever After” and “Declawing Alternatives” for more details and ideas. This may be as simple as throwing on a slip cover, or draping a thick towel, fleece, or blanket over the arm of the sofa. What kitty likes about upholstery fabric is its resistance–this is what allows him to get the grip needed to stretch. If he hooks his claws into material that gives, or immediately pulls off and falls on his head, he’ll lose interest in no time. Another simple (and perhaps more esthetically pleasing) plan is to use double-sided tape, such as Sticky Paws. This product has a special adhesive that does not damage the furniture, but feels disgusting to the cat’s sensitive paw pads. It may need to be replaced every month or so as dust and hair accumulate on the tape’s surface, but for many cats one or two applications is enough to dissuade them permanently. Purrfect Paw is a clear plastic protector for the corners of furniture without the stickiness of other products. A similar product is “Sofa Savers.” Call for information at 972-790-6658. For aggressive or unremitting scratching, replaceable soft plastic caps for the claws called “Soft Paws” are a good solution. These caps are glued onto the nail; they’ll come off by themselves after a few weeks and need replacing. They come in fun colors (as well as clear) and really do the trick. While you’ll probably want your vet or groomer to apply them the first time, it’s not that hard to replace them at home [instructions]. It’s best to never play or roughhouse with your kitten or cat using your bare hands (or even covered-up hands!). You definitely don’t want her to get the idea that biting or scratching human skin or body parts is okay. And while it’s fun to watch the kitten attack your wiggling toes under a blanket, when he’s 15 pounds with razor-sharp, inch-long fangs, it’s not nearly as amusing. Serious aggression problems require assistance from your veterinarian, or your friendly behavior consultants at Little Big Cat! Of course, conscientious nail-trimming [click here for instructions] will keep the claws blunt and minimize the damage that kitty can do to fabrics, furniture, and fingers. 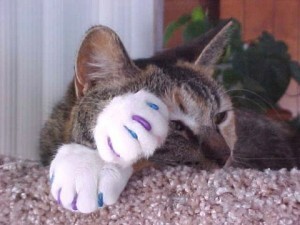 If you have a declawed cat, it is not too late to undo at least some of the damage. Spirit Essences offers “Declaw Remedy” to help heal both the physical and psychological truama that occur with declaw surgery. Fortunately, most people truly love their feline companions and want to do what’s best for all concerned. If you are one of these wonderful people (and if you’ve read this far, we’re pretty sure you are! ), please think carefully about this beautiful little animal who trusts you and relies on you for her very existence. Please make the humane choice – and DO NOT DECLAW!